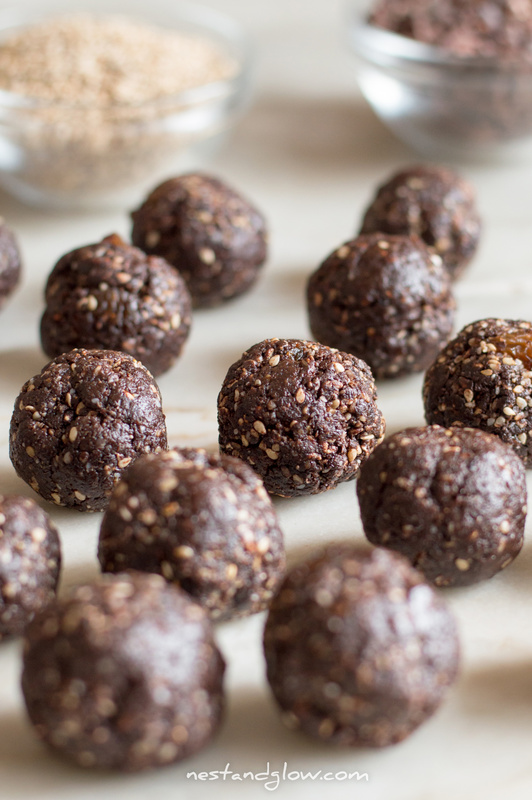 These 3-ingredient chocolate sesame halva balls can be made in a few minutes and are the perfect on the go energy snack. Full of protein, heart healthy fats, calcium and fibre. Suitable for raw vegan, gluten-free, refined sugar-free, paleo, nut-free and plant-based diets. These are called halva as they are a sweet that is made from sesame seeds. Halva or halvah is a very broad term that can be used to describe so many sweets from different countries that are a mixture of seed or nut butter that is sweetened. This healthy vegan halva recipe is great as all the sweetness comes from raisins so you get the whole fruit complete with fibre. Don’t worry that sesame seeds aren’t totally broken down, this is intentional to give texture and a speckled appearance. If you do want a totally smooth halva then grind your sesame seeds first. Ground sesame won’t give a solid halva type as it isn’t cooked with lots of sugar, so will be more of a fudge consistency. The simplest things are often the best and this and I love this simple 3 ingredient halva recipe. Use the highest quality and freshest ingredients you can afford for the natural flavours to shine through. I usually use unhulled sesame seeds to make this as they have a richer earthy flavour and more nutrition. But for a less earthy taste in your healthy halva use the lighter hulled sesame seeds. You can roll these truffles in chopped nuts, seeds and dried fruit to add more flavour and decoration. Chopped pistachio, freeze-dried raspberry and coconut shreds make a very tempting halva truffle. Halva is common in so many regions including Europe, Asia and Africa. The two ingredients that all halva recipes have are nuts/seeds and sugar. The word halva has Yiddish, Turkish and Arabic origins and entered the English language around 1840. This raw vegan halva recipe can be made caffeine free by replacing the cacao with carob powder. It will have a similar rich flavour and still be just as nutrient dense but not quite the same depth you get from chocolate. Use this simple and easy recipe as a base to add what you like to. I would often add some cinnamon, cayenne pepper or wheatgrass to add more taste and nutrients. Did you know that cacao and cocoa are two different products? They come from the same tree but end up very differently. The difference between cocoa and cacao and what is healthier. Place everything into a blender or food processor. Blend until ithe halva paste starts to stick together. You may need to scrape the sides or shake your jug a few times between blends. 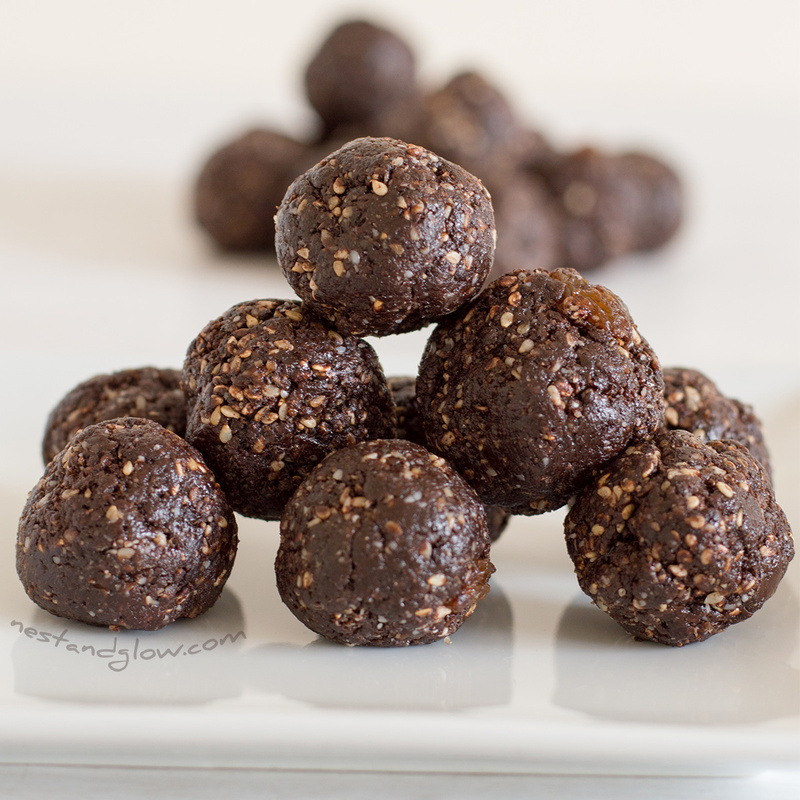 Scoop about a heaped tea spoon and roll into firm halva balls. 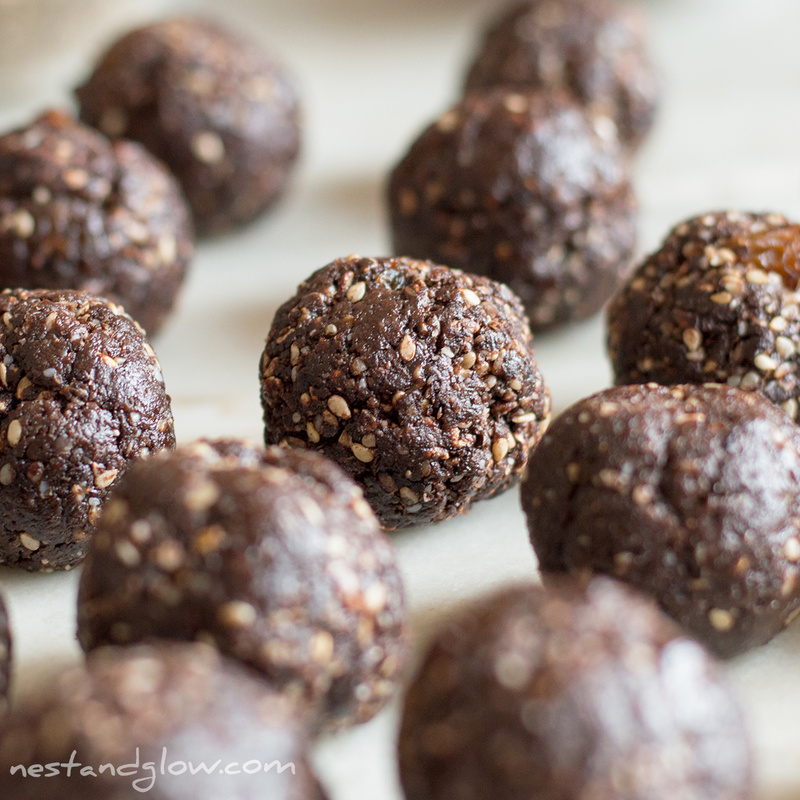 Store healthy halva balls an airtight container in the fridge, where they will be good for a few weeks. This is a beautifully simple and I’m sure delish recipe! Do you also have one without chocolate? I’m thinking the raisins or even dates would give an off color if the halva was sesame flavor. Figs sound like a great idea. Thank you! Just made those and having them with my favorite black tea with cardamom. So good! 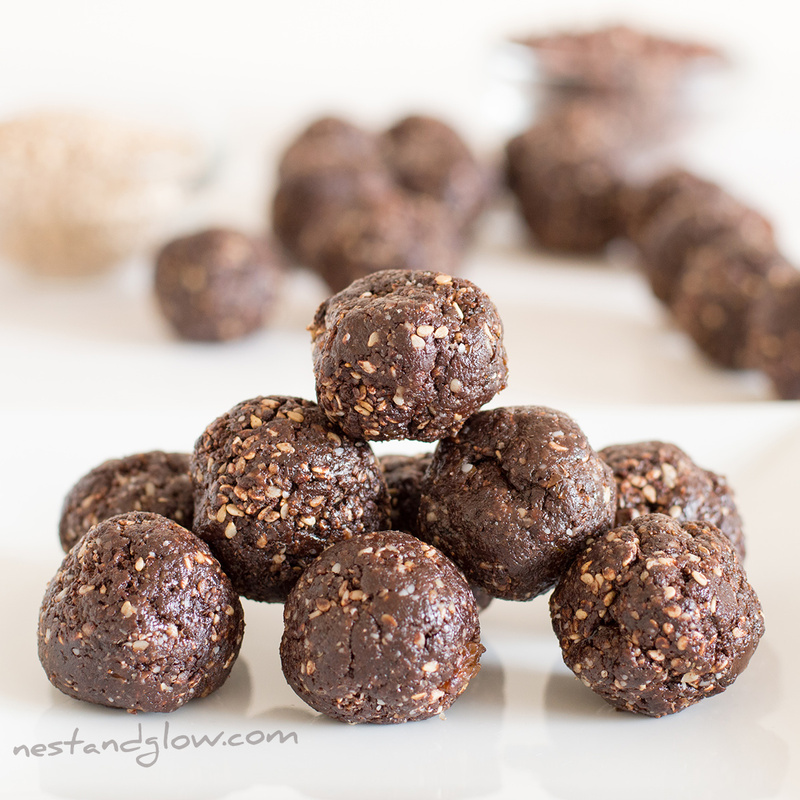 What blender is used in the nut ball video and other sticky thick food prep? Can other nuts be used like walnuts? wilt give the same consistency? They came out great, but a note I would add is if the raisins are soaked just a bit it would be easier to blend. I had to add a bit of maple syrup and vanilla extract to compensate for the lack of moisture.